Body Zone Physical Therapy is a privately-owned orthopedic and sports physical therapy center dedicated to providing the most comprehensive and personalized patient care in our community. We’re committed to helping each patient achieve maximum physical function and quality of life by providing effective and compassionate care for your individual needs in a comfortable, friendly and family-centered setting. Our state-of-the art facility is located on the second floor of Body Zone Sports and Wellness Complex. 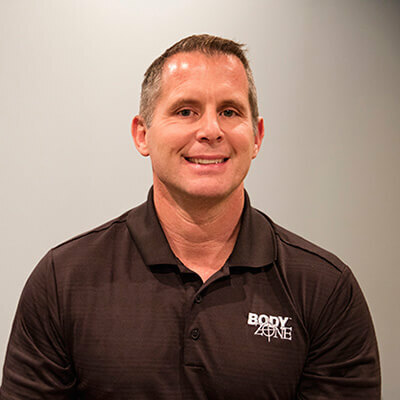 Led by Dr. Randy Yocum, Body Zone’s team of physical therapists are highly skilled in movement assessment and utilize the most advanced manual/hands-on therapy, treatment techniques, therapeutic exercise and patient education to restore function, decrease pain, manage your injury and speed recovery. Dr. Randy Yocum graduated with a BS in Human Biology and Doctorate in Physical Therapy from Temple University. He is also a Certified Strength and Conditioning Specialist. He specializes in the treatment of sports and orthopedic injuries with more than 23 years of diverse experiences offering truly personalized hands-on manual therapy. Areas of interest include ACL rehabilitation and prevention, pre- and post-operative knee and shoulder rehabilitation, sport-specific rehabilitation and athletic performance enhancement, pre- and post-operative total joint care, HawkGrips IASTM and kinesiotaping. Dr. Yocum has served as the physical therapy and strength and conditioning consultant to many local professional and club sports teams including the Reading Royals, Reading Express and FC Revolution. Our team of therapists and strength and conditioning specialists focus on science-based treatment of sports and orthopedic injuries in addition to providing post-operative rehabilitation, post-concussion rehabilitation and injury prevention programs. To see a physical therapist at Body Zone Physical Therapy, you can be referred by a healthcare provider, or opt for self-referral under Pennsylvania’s Direct Access Law. Pennsylvania is one of many states that allow physical therapists to evaluate and treat, under certain conditions, patients without a referral from a physician for 30 days. After 30 days, you must obtain a physician’s referral to continue your treatment plan. Call your insurance plan before making an appointment to verify coverage. With the mission of helping you reach your full potential, new Body Zone Physical Therapy patients and a family member or special caregiver are invited to enjoy Body Zone’s fitness and aquatics centers with complimentary 90-day memberships. This is activated for new patients at your first appointment. If you can’t find an answer to a specific question, please contact us. Physical therapy helps people of all ages who have medical conditions, illnesses or injuries that limit their regular ability to move and function. A customized physical therapy program helps individuals return to their prior level of functioning, and encourages activities and lifestyle changes to help prevent further injury and improve overall health and well-being. How will I benefit from physical therapy? From pain relief to fall prevention, the benefits of working with a physical therapist are numerous. Learn more here. Where is Body Zone Physical Therapy located? Our physical therapy department is located on our 2nd floor. You may take the stairs or the elevator up to the desk and Body Zone staff will direct you to the office. Please wear comfortable or loose clothing. Locker rooms are available on our 1st and 2nd floors for changing and showering. How long and frequent are appointments? Depending on your treatment plan and progression, we usually schedule two or three 45- or 60-minute visits per week. May I use the fitness center or pool during my visit? Non-member physical therapy patients receive a free 90-day membership. This is activated at time of first appointment. Do I need a prescription from my doctor to make an appointment? No, not necessarily. We are a direct access provider. Certain insurance providers may require a prescription from your physician. What are financial requirements at time of service? All co-pays are expected at time of service. Body Zone Physical Therapy is a new practice, but we’ve been in the industry for a long time, and we’re proud of the impact we’ve made on our patients. Orthopedic surgery on the horizon? Sign up for your private 15-minute session with a Body Zone Physical Therapist to learn more about your upcoming procedure. Get any pre-operative questions or concerns answered with regards to your upcoming orthopedic surgery. Get a quick review of pre-operative exercises to help prepare your body for surgery. Learn what to expect in the hospital immediately after surgery. Get more info about your recovery and post-operative rehabilitation.